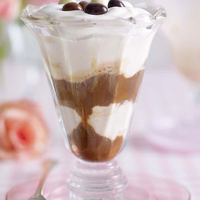 Chill 2 sundae glasses, then whisk the cream into soft peaks, adding the sugar as you beat. Make up the coffee and add the brandy or liqueur if using. Put 2 scoops of ice cream into each glass and pour over the hot coffee. Spoon the whipped cream on top and sprinkle with the dragées. Serve immediately with a long spoon. iced coffee so serve it with a straw if you prefer. For a more intense coffee flavour use Waitrose Organic Coffee Ice Cream. The Kahlúa Licor de Café not only makes a good ingredient here, it’s also perfect to drink alongside.